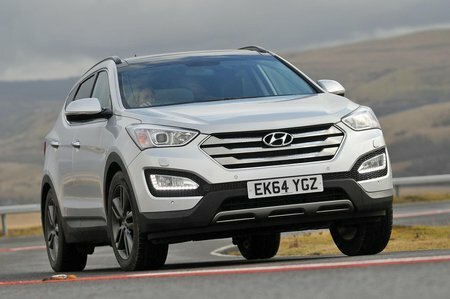 Used Hyundai Santa Fe Review - 2013-present | What Car? What's the used Hyundai Santa Fe 4x4 like? A few years ago, those in the market for a seven-seat SUV had very little choice, and would often end up having to choose a more sober-looking MPV instead. 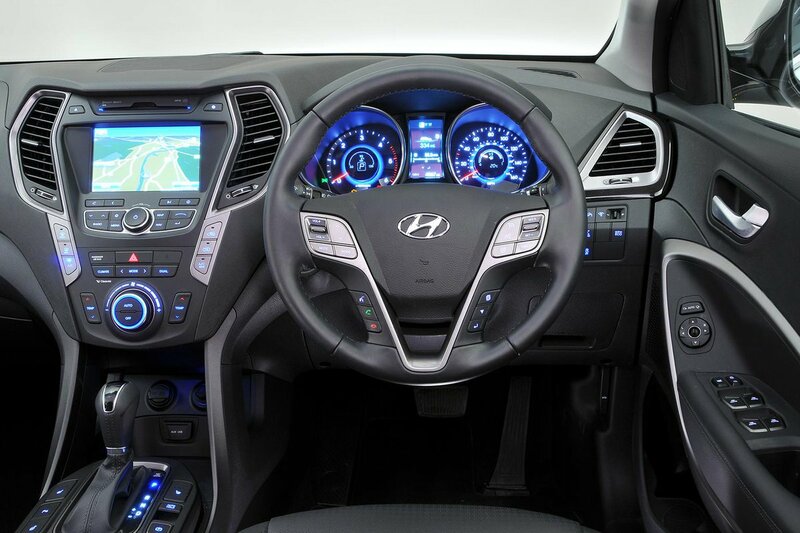 Now, though, the class has grown, and among a number of large SUVs the Hyundai Santa Fe stands proud, offering a spacious and versatile interior, a long warranty and a robust build quality, as well as, in this third generation model, more than its share of striking good looks. Interestingly, buyers of the car when it was new could also specify to have it with just five seats, but again it seems most opted for the full seven. It’s also kept things simple, especially in the matter of engine options. The Santa Fe has but one engine, a 194bhp 2.2-litre diesel, and it provides the car with enough oomph to make light work of sharp inclines and heavy loads and even occasionally both at the same time, while still enabling reasonable fuel efficiency. Every version of the Santa Fe comes with four-wheel drive as standard, as well as a six-speed manual gearbox, although the optional automatic gearbox is the more popular option and, in our opinion, deservedly so. As with the engine, trim options are kept to a minimum. Earlier cars had an entry-level SE trim, but this was phased out and replaced by Premium. The entry-level Premium model included 18in alloy wheels, auto lights and wipers, cruise control, electric windows, parking sensors and electrically adjustable, heated and folding door mirrors on the outside, with dual-zone climate control, an electrically adjustable driver's seat, a premium sound system, heated front seats and a touchscreen infotainment system with sat-nav included on the inside. Opt for the seven-seat version and besides an extra row of seats, there is climate control in the rear and adaptive suspension included. The range-topping Premium SE models come with luxuries such as 19in alloys, blind spot detection system, heated steering wheel, xenon headlights, lane departure warning system, panoramic sunroof and ventilated front seats. Inside is a solidly constructed interior that makes use of some good-quality materials and nicely damped switches. The driving position is multi-adjustable and the visibility is good, and the dashboard and its surrounding controls are all logically laid out and easy to use. But its raison d’etre is the space on offer. There’s plenty of space for driver and passenger up front, while three adults will find the second row of seats manageable for short journeys. Likewise, the two third row seats are fine for children, and adults will be happy in them for shorter distances. These rear second and third row seats fold almost flat, and leave a large load bay. The boot opening is nice and wide, too, which means getting large things in and out is relatively easy. The Santa Fe is also a useful proposition if you regularly use a car for towing. Its maximum towing capacity is 2.5 tonnes in manual cars and 2.0 tonnes in an automatic one.